As we gear up for our second exciting county blitz in Baker County this weekend, we wanted to highlight our results from last month’s Morrow County blitz! Between May 30 and June 1 we had 15 dedicated birders spread out across Morrow County in Northeastern Oregon. Our teams counted birds in and around 50 out of the 59 Hotspot Squares randomly placed throughout the county. Birding “Blitzers” counted birds across the entirety of Morrow County! Red dots indicate eBird checklists. 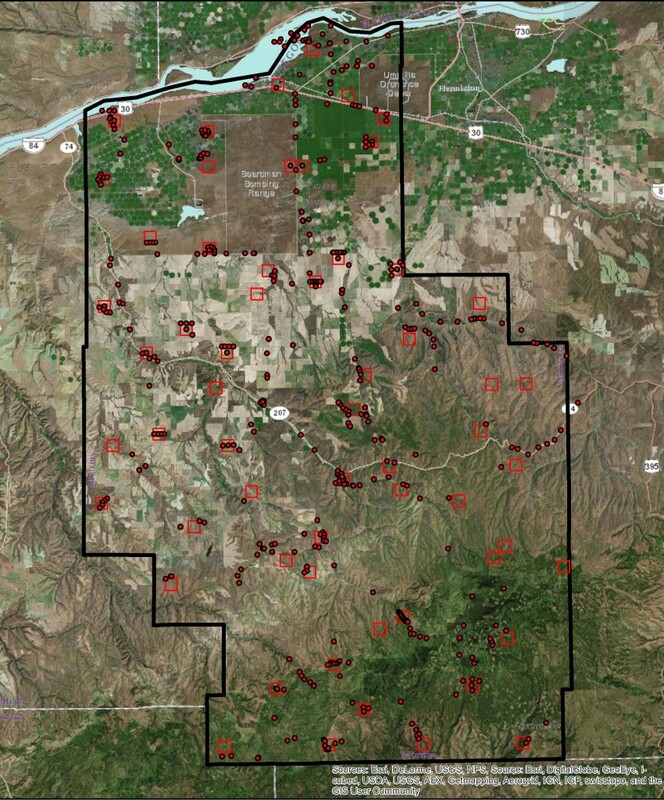 Red boxes indicate randomly placed, 1 square-mile county hotspots. Map created by Tyler Hallman. Plus a scattering of Dusky Grouse, Yellow-breasted Chats, American Avocets, and Common Yellowthroats. Our efforts generated a lot of conversation about changes in bird populations and ranges over time. We’re still compiling records and tallying checklists. Stay tuned for a complete summary of our summer blitzes, including participants, total checklists, and areas covered. Many thanks to all of our birders who participated! Interested in being part of this fun experience? It’s not too late to sign up for our Baker County blitz, this weekend! We look forward to finding more interesting, exciting birds on our future blitzes.